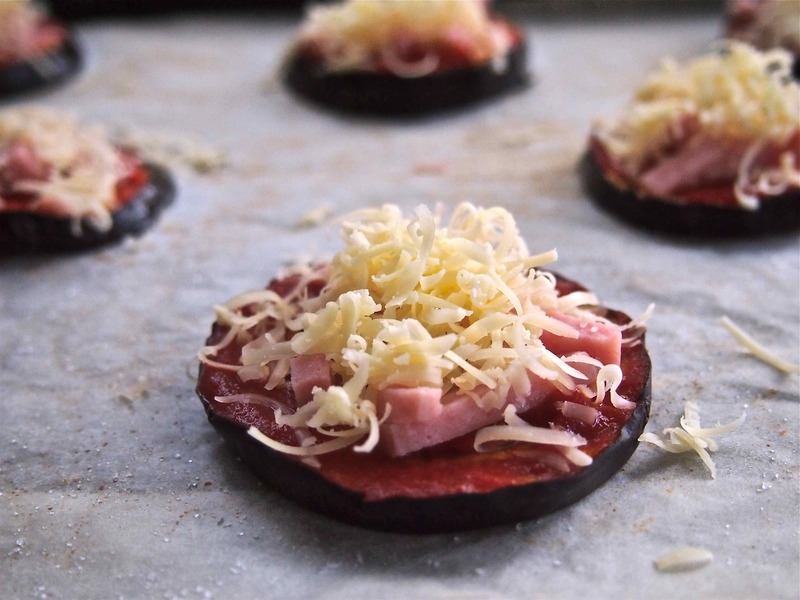 As we get older, though, that nagging voice at the back of our head tells us that we should make healthier choices – so when I came across this version of mini pizzas which uses eggplants instead of a traditional pizza bases, I was keen to try it out. Step 1: Preheat oven to 220°C / 425°F. Prepare two baking trays with baking paper. 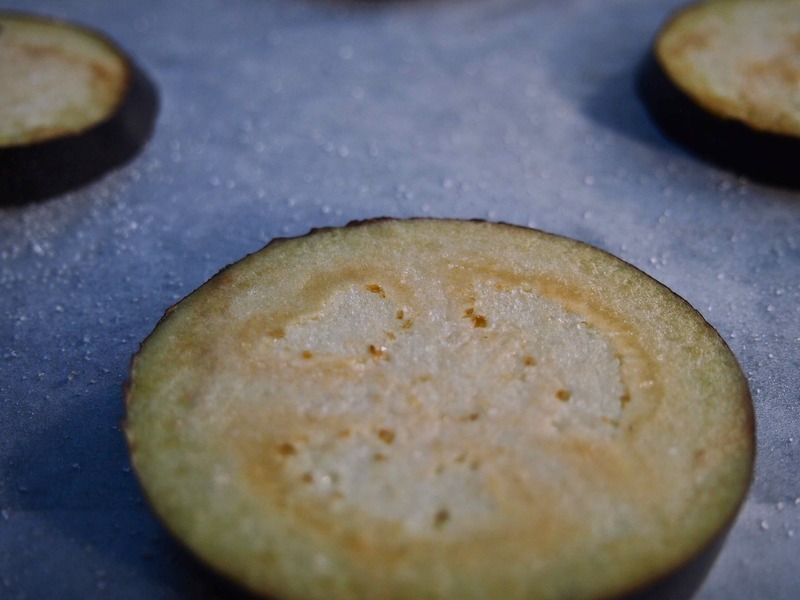 Step 2: Slice the eggplants into 1 inch thick slices (either circular or lengthways – I prefer circular slices). 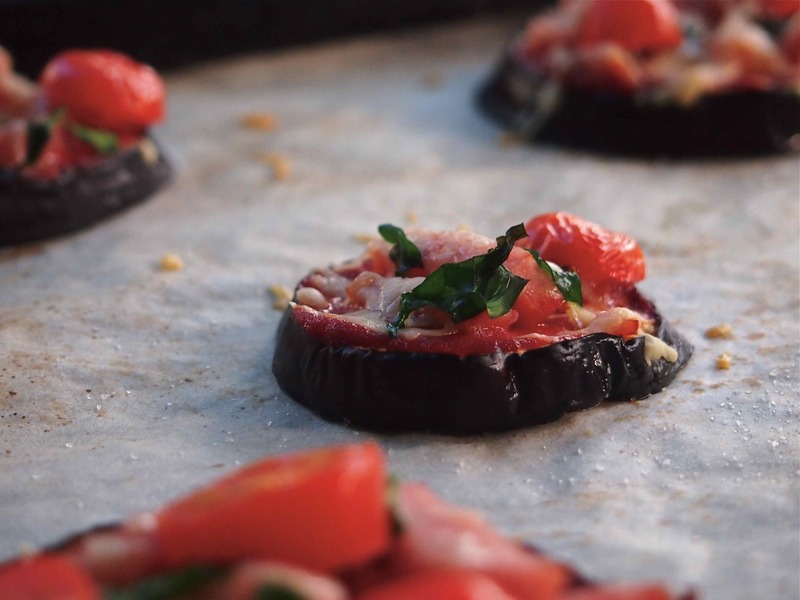 Then place the eggplant slices onto the prepared baking trays, spray the slices with olive oil and sprinkle with salt and bake in the oven for 15 – 20 minutes. Step 3: Remove the baked eggplant from the oven. Step 4: Spread approx. 1 teaspoon of tomato sauce on each baked eggplant (try to cover it as evenly as possible and across the entire eggplant slice). Step 5: Decorate your eggplant with the other ingredients you wish to have on it. I used cheese, spinach, ham and cherry tomatoes. *Note I have the cheese as the final ingredient so when it melts it helps to hold the other ingredients to the eggplant. Step 6: Place the eggplant slices (now made up with all ingredients) back onto a tray and back into the oven for 3 – 8 minutes or until the cheese has melted. *Note keep a close eye on the eggplant as it can burn very fast and then all your hard efforts will have gone to waste! Also make sure you have paper baking under the eggplant otherwise the melted cheese will go everywhere and will be really annoying to clean! *Note if you are using lactose free cheese/vegan cheese you may need to keep the eggplant mini pizzas in the oven for longer for the cheese to fully melt. Step 7: Serve while hot (but not burning). *Note it is a good idea to serve with napkins as, like with pizza, it can be a bit greasy. Step 8: Each individual person can season with a little salt and pepper if they would like :). 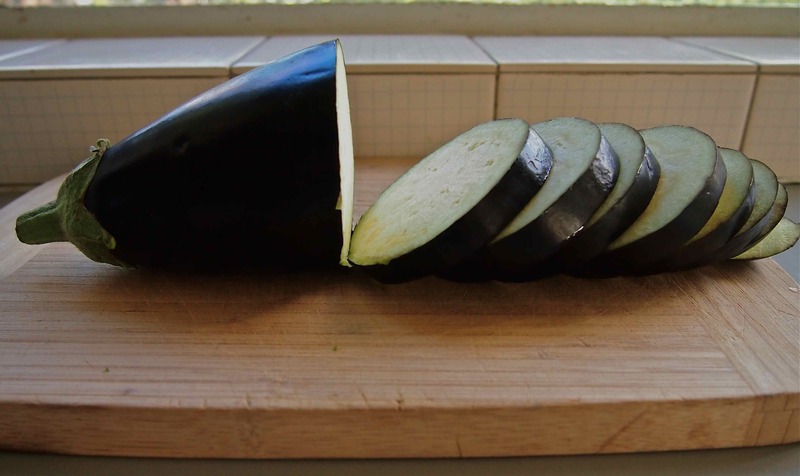 Step 2: Slice eggplant into 1 inch thick pieces. Step 2: Place sliced eggplant on baking tray and sprinkle with salt. 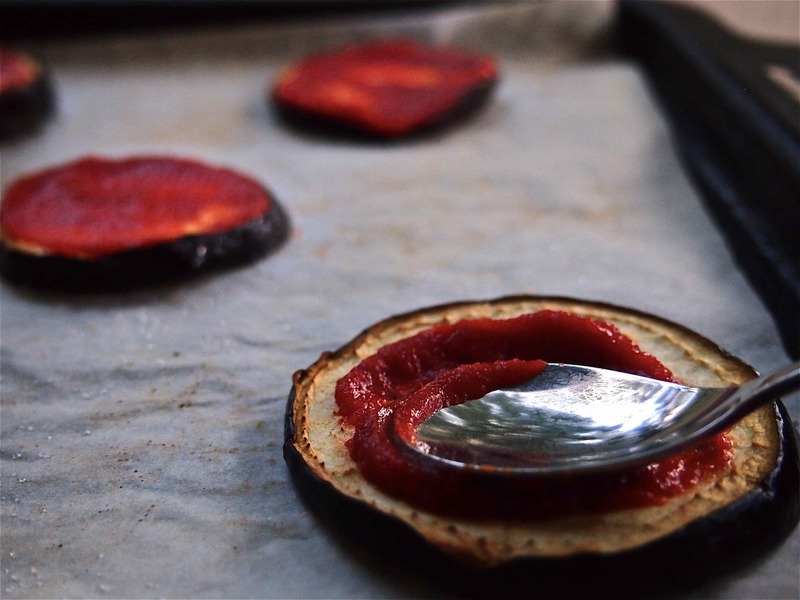 Step 4: Spread 1 teaspoon of tomato sauce on eggplant slices. Step 5: Decorate your eggplant slices and place back in the oven. Step 7: Take eggplant slices out of oven, allow to slightly cool and eat! This goes well with basically anything and would be great to serve as an appetizer, main meal or even just as a snack, depending on how many you make! I think this is a great one when you are having lots of people around as you can mix and match the ingredients very easily and it can be put together with minimal effort and time while other things are going on around you. You can cover most food intolerances and preferences very easily by just omitting and changing what is on the pizza – how easy is that? It is also a very easy recipe to do with the help of little kids! I did try this recipe out with lactose free cheese and it still worked out rather well. A tip for POTSIES – if you need to get your salt intake up a little further for the day, try to choose toppings with higher salt content such as sun-dried tomatoes, salami, cheese and olives. You can also always sprinkle a little extra salt on top once the mini pizza’s are out of the oven. P.S This recipe is the brains of Eat Good 4 Life and has been altered. P.P.S Be careful when you hold the pizza as it isn’t as sturdy as a typical pizza. Thanks MyKitchenOnFire! I hope you enjoy them! This is so clever! I love ingenious recipes that make “naughty” foods healthy. Will definitely have to try this! I know! It’s great when you find a good healthy version of a ‘naughty’ food – particularly when it doesn’t lose flavour :). Yes it is so easy! It’s very full of flavour as well :). Totally bookmarking this for my next cooking escapade; perhaps I can even cook it with the hot chips, I still haven’t gotten round to it yet 😦 Looks so delicious. Thanks for sharing! That’s a great idea! This would go great with hot chips :). Oh, what a great idea. 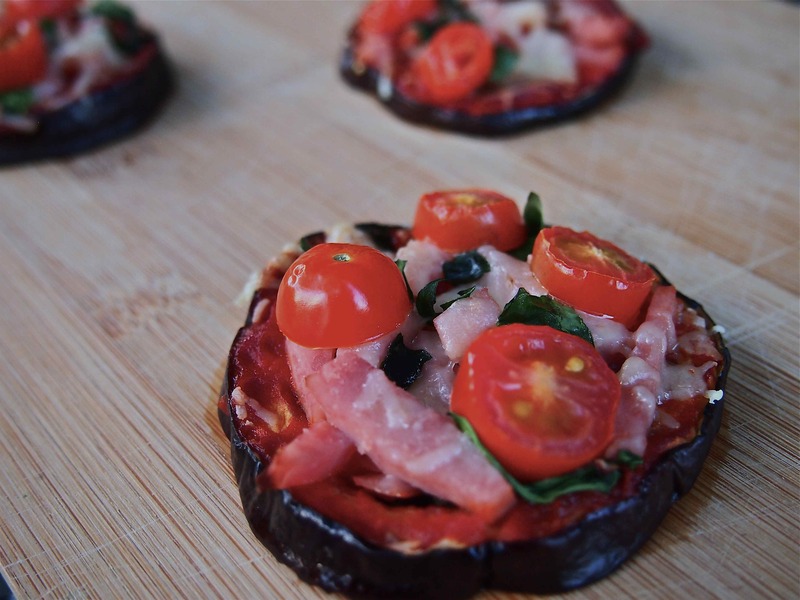 Next time I’ve aubergine in my veg box, I’ll make mini pizzas! Straight from the veggie box that’s even healthier! I’m impressed that you grow your own veggies!! This sounds incredible! The pictures were such a great addition and it looks so delicious. I am so excited to make this. Thanks LucyDanvers! I hope you enjoy them! Let me know how you go :). You’ll love them them :). Let me know how you go and whether you both like them! Haha you’ll love these. 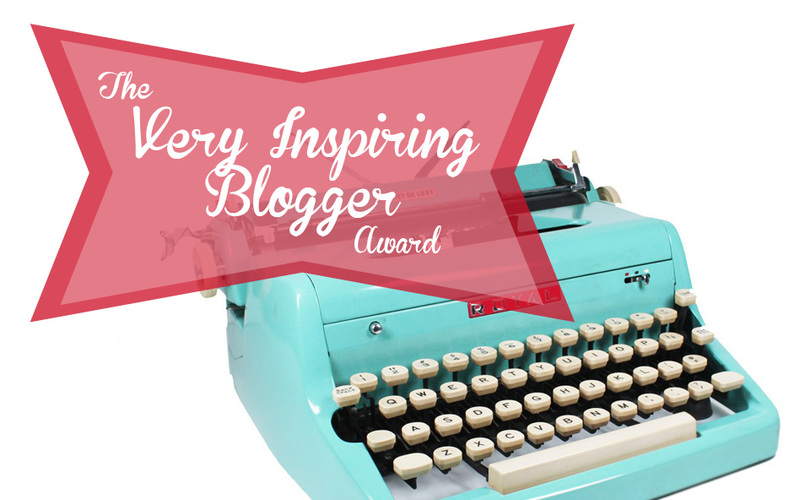 Thanks for the lovely comments! Nice one. I haven’t been using eggplant too much… yet. Maybe this was the recipe you’ve been waiting for to start? Haha! It is really quick and easy and tastes great. I’ve made it quite a few times for afternoon tea when i’ve had friends over as it is just so easy :). Let me know how you go if you give it a try! Sure. When my friends will come. Or maybe I should try to adapt it for a bbq? Anyway, I’ll tell you when I do that. Definitely tell me how that works out! This is truly lovely and this will be a recipe I will try this week. Thank you so much! Thank you! Let me know how you find the recipe when you try them :). So cute! I’m trying these tonight with vegan cheese! Yay! Let me know how it goes! I’ve tried it with vegan cheese and it works just make sure you put it on top of everything so that it melts covering the other ingredients :).